It has a directly heated cathode, so the cathode heater is also the cathode. Voltage across cathode heater should be about 3V. It should not glow visibly red. Anode voltage should be anywhere between 10V and 50V. If the VFD glows too brightly, the phosphor's life will be shortened, and it will become duller. 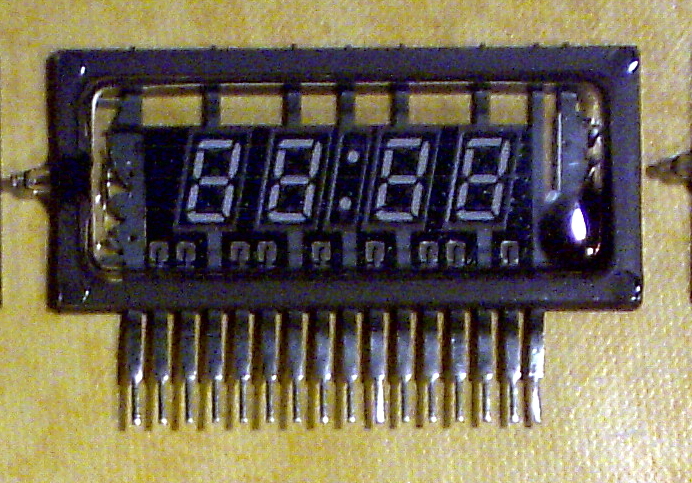 Each VFD usually contains multiple digits. Each digit has a corresponding grid, which seperates the cathode from the digits' segments. The segments of each digit are common with their corresponding segments on all the other identical digits. For example, a VFD with 4 seven segment digits will contain 7 segment connections, 4 grid connections, and 2 for the cathode heater. +V of the anode supply should connect to the segment(s) that are to be activated, and the grid which corresponds to the digit whose segments you want to activate. 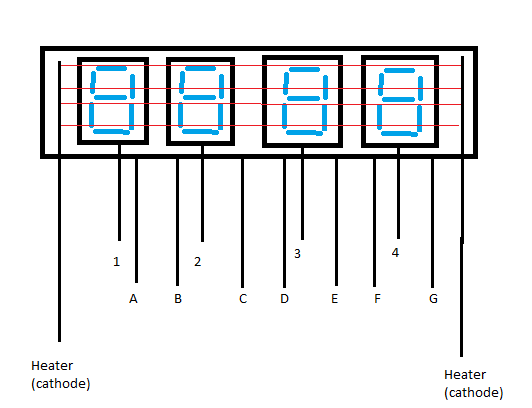 In the diagram above, the connections labelled 1,2,3,4 are the grids. And the connections labelled A,B,C,D,E,F,G are the segments (anodes). The connections labelled "Heater (cathode)" are either side of the cathode heater. A voltage of +12V relative to either Heater connection would be applied to A,B,C,D,E,F,G and 2. A voltage of +12V relative to either Heater connection would be applied to B,C and 4.